Another gem on the Scenic ECR Beach way, Dakshinachitra is a cultural living museum of art, architecture, lifestyle, crafts and performing arts of South India. 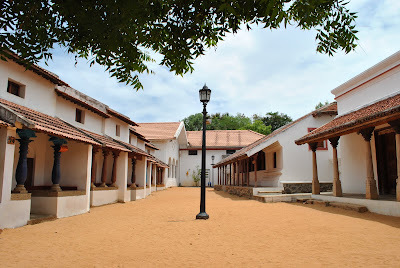 It can also be called a Real Time Museum in the IT lingua, where you can explore 17 heritage houses from Kerala, Tamil Nadu, Karnataka and Andhra Pradesh; experience the life in recreated Streets and also see real craftsmen at work, creating pieces of rustic and authentic art. Anyone studying art history or working towards an MFA degree would not want to miss an opportunity to come here. A must visit if you come to Chennai! Going to Dakshinachitra doesn’t take much effort, you can hop on any bus going to the ECR, or if you have a vehicle, can drive all the way to this place which lies just after MGM Dizee world, 3 km from the Toll Gate. The center is open from 10 AM to 6 PM, the tariff is given in the table below. I did not visit Dakshinachitra as a visitor this time, my sole aim being to take photographs. As soon as we entered the lobby after taking the tickets, I saw a lady sitting on the bench, waiting for someone. There was something in her demeanor which prompted me to steal a photo of her leaving my hesitation for candid photography aside. 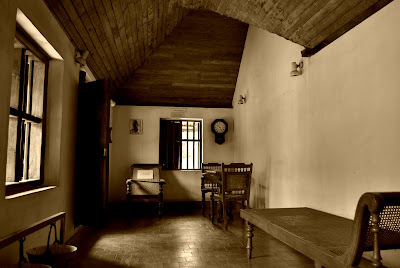 The first place to visit after getting inside, for me, has always been – Kerala ! Well, do not be surprise, if not the state, at least the spirit of Kerala is well represented here by four heritage houses. 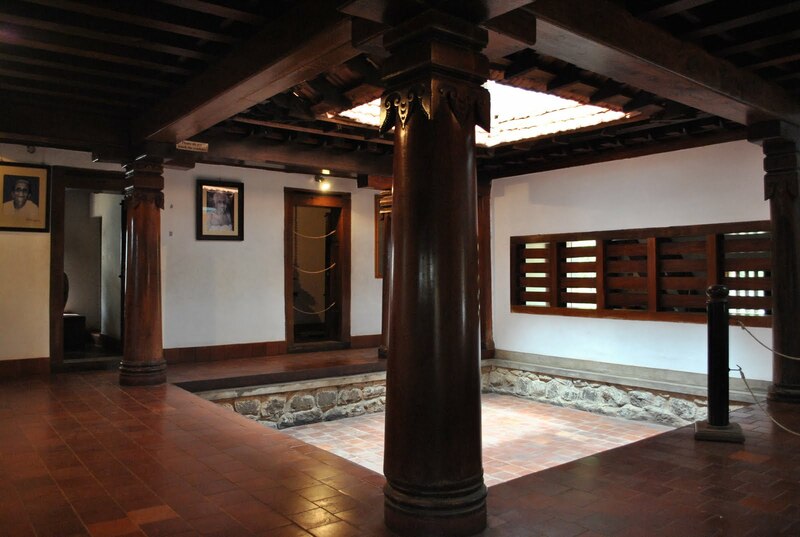 The first house is a traditional Nair house, you enter into a small courtyard, and then to even smaller rooms, the walls are made of bricks and the roof is inlaid with rich woodwork. There used to be a stairway to the rooms on the first floor, but it has been made off limits now. The other houses worth noting are the Syrian Christian House, made entirely of wood with beautiful engravings and the Calicut house complete with the lithographs of Raja Ravi Verma. As soon as you ‘move out’ of Kerala, you land up straight in the Iyer’s street of Tamil Nadu. It’s the recreation of a typical street with different types of Tamil Nadu houses on both sides. Go to a little right and you will come to the Craftsmen’s hamlet, complete with the Potter’s house, Weavers workshop and a gifted artist creating sheer magic out of molten glass. For some unknown reasons, the Karnataka section is mostly tribal in nature. The houses here are made of stone and have a dark and mysterious look about them. There is a house which contains scary looking masks made of metal. With the dim light around, it was a spooky feeling going inside alone, even if you knew it was all show. The last section is Andhra Pradesh, much smaller than the other three sections. 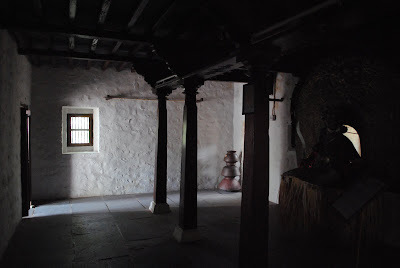 It consists of just one house, that of a traditional weaver. You actually get to see the tools used for making clothes and other household artifacts. 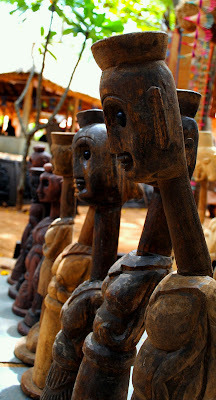 Apart from the the houses, you also watched artisans and artists creating art in their workshop. With a very small fee, you can also learn the crafts like pottery and toy making. Dakshinachitra helps sustain the art forms with the help of the donations. Watch out for some pics of these extraordinary artists in the picture gallery.On the junction of the four sections, there is a Meena Baazar, complete with all the curios from across India, made by the artists who live here. What drew my attention were strange looking statues which somehow looked like the Megalithic stone structures of the Eastern Island. Dakshin Chitra, a set on Flickr. PreviousIn God’s own backwaters ..
Nice pictures . Heard a lot about this place . Thank for posting about this. I hope to do a road trip from Chennai to Pondicherry and Tranquebar in December. Will definitely try and visit this place. nice shots, informative post as well..would love to visit this place some day ! !